Who was there: Besides Cap Hill’s usual suspects, there was a mix of developers, architects, city employees, plus a few business owners and residents. Around 150 packed into the Northwest Film Forum’s main theater for the meeting. I also counted at least three media types, myself included. The Stranger and the Daily Journal of Commerce also sent reps.
My quick, totally shallow assessment of each contribution: Killoren: Out of touch, Dunn: Wanted to say more, Linke: Wanted to say less, Stineback: Knew her stuff, Kerns: Poker player, Wright: Had more to say but knows panels aren’t the best communication format for deeper discussion. First question to the panel came from a CHS discussion of what we’d like to know about the future of 12th (made me very proud! ): Is there another area in the city like 12th we can look at for comparison and ideas of what to and not to do? The panelists and the crowd started buzzing but nobody had an immediate answer. “Telling,” said moderator C.R. Douglas. The panel finally offered up Columbia City citing the area’s historical preservation work. Recurring question not really answered: How do you achieve development that preserves local businesses and reflects the neighborhood? Anti-Ballard line of the night: Panelist Elizabeth Linke, Ballard resident and owner of 12th Ave’s CHAC building that will soon house Velocity dance studio, described new Ballard developments as slums and says what has happened there drives her to preserve Hill arts. Issue for the future: How to improve pedestrian experience at 12th and Madison. TDR count: Transfer of development rights programs come up pretty frequently in discussions around development these days. The panel contained itself to pretty much only one discussion of TDRs on the night. Nice work. What I mean by out of touch: City’s director of Office of Arts and Cultural Affairs Michael Killoren said he thinks a transfer of development rights program will be part of the solutions the City Council puts in place when it votes on Pike/Pine zoning overlay legislation later this spring. City staff have already said it won’t be. Liz Dunn said she won’t rent to national chains. Her tenants must be local and independent. Better longterm value, she says. Stuff to follow up on: Dunn was asked about the former 1200 Bistro location and said she’d heard “somebody in the neighborhood” had wanted to buy it and restore it to its “1930s glory” and get the city to give the building landmark status. At the Pike/Pine City Council Brownbag April 21, Councilmember Clark did say that working out the TDR equation would be the next phase of work. Though she did not mention a timeline or more specifics. I know I would love more specifics about that. 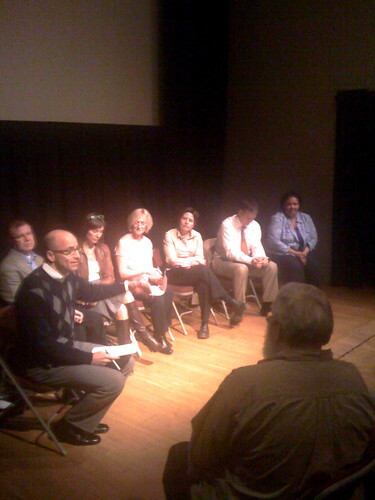 I found panelist Michael Killoren to be informed with current arts and development issues. When he mentioned Transfer of Development Rights (TDRs) being part of a recommendation, he was referring to the forthcoming recommendation from the Cultural Overlay District Advisory Committee. He was not talking about the City Council solutions the article mentions above. That’s exciting to hear about a mixed-use project replacing the storage site someday. That deadzone along both sides of the building is annoying. Pretty good little summary here. With all the talk about historic preservation and saving old buildings and the character of the neighborhood I am really surprised that making parts of Cap Hill a historic district is never really breached. It seems like by making it ra historic district with somewhat loose guidelines you could better protect what exists and still allow development to take place. Its not like development has come to a standstill in South Downtown or Columbia city, although it certainly isn’t as robust as up here. But perhaps thats a good thing. Attended, very crowded, CR Douglas, moderating, did a great job of prying out information – much better than usual. It is interesting to see so few business people in these talks – and so few resident of the area. The CHAC building is going thru seismic refit and is now empty and will be arts and cultural space later. There was no comment on the loss of a nice eating spot, basement bistro for a young crowd or exercise class for the masses. Really defining the “good neighborhood” is elusive and seems to depends on the speakers viewpoint. Cap. Hill Housing is owed great thanks for all their work, and the big project involving the police parking lot, if it works, is all to their credit. There was not enouhg talk about a streetcar on 12th. It did come up, some audience seemed surprised it is funded and will be build soon. Seattle U soppurts the 12th st. route, good, and it seemed the audience was Ok as well. In my opinion that project is more important than any of the rest of the discussion. Period. Completely. Money has dried up for most real estate projects, but, the streetcar line is fully FUNDED by Sound Transit and can go into construction in a couple of years. NEED TO MAKE IT HAPPEN AS A COMMUNITY. I am rowing tired of developers dominating the conversations, repeating endlessly how they can make money on such and such. We know they make money, tons in some cases, the definition of community and how to shape it by good planning is the issue for me. And there needs to be something more than up scale food places in the reworked buildings. Ms. Dunn doesn’t like chains, I for one am damn glad we have Walgreens and QFC on the Hill — I use both all the time, and walk. Get involved if this is your bag, interesting, and more voices of residents and business owners are needed. King County Detention Center: The south end of 12th Avenue doesn’t get nearly the love it deserves. Maybe it’s because SU had several locks of buildings and play fields that turn their back on the street between Capitol Hill and Little Saigon. Or, perhaps, everyone’s afraid of the kid jail on East Alder Street. King County Juvenile Detention and it’s asphalt tundra consume 8.5 acres, but the county—which wasn’t represented at the meeting—is nurturing plans to replace the parking lot with a multi-acre, mixed use project. One of the challenges: King County is in a tough financial spot these days. Godspeed, county. Good for Liz Dunn for choosing to not rent to chains. Obviously, the big chains, (groceries and pharmacies) are a neccessity but she doesn’t own those kinds of large spaces. 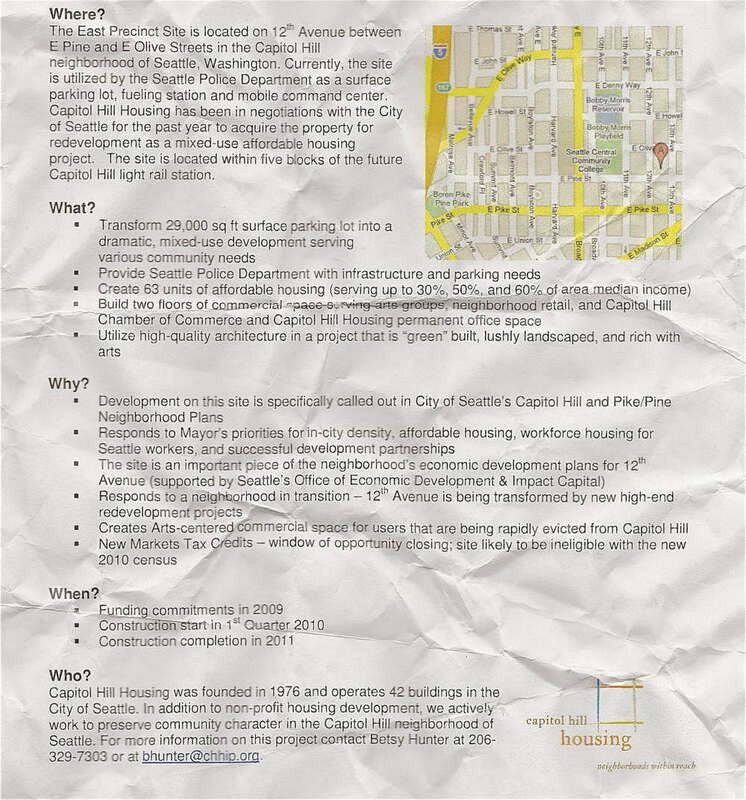 Capitol Hill really doesn’t need any more Desert Suns, or Subways, or Kinkos…we have more than enough. And, yeah, I’d like to see more non-food businesses; more shops opening and fewer pricey restaurants/bars. also, some of the 3,000 automotive related businesses on the Hill could relocate…yes, we need some of these businesses, but how many body shops/glass replacement/muffler shops/luxury dealerships does one neighhorhood need? They create dead zones in shopping districts and have negative eye/nose/ear appeal. Hopefully, as land values rise and more CH residents get rid of their cars, they’ll start to relocate to SoDo.